The Channel was rough. Waves, some two metres high, made sailing difficult even at reduced speed. The ships and landing crafts were tossed around and many got seasick. In front of the fleet, minesweepers cleared a route through the mined area protecting the coast. The 31st Canadian Minesweeper Flotilla, as well as other Canadian ships incorporated into British flotillas took part in the operation, clearing ten lanes marked with lighted buoys. At nightfall, everything was going according to plan. In the distance, the bombings could be heard; at 2331 Bomber Command launched an assault against the coastal batteries in the landing zone. Bombs fell until 0515; in all, 1,136 sorties, 5,268 tonnes dropped. The Royal Canadian Air Force 6 Group was part of the operation, targetting batteries at Merville, Franceville and Houlgate. Meanwhile, French resistance fighters warned by BBC coded messages undertook more than a thousand sabotage actions during a single night. At midnight, the 6th British Airborne division, which included the 1st Canadian Parachute Battalion, dropped off north of Caen to protect the eastern flank of the landing area. On the western side, US paratroopers from the 82nd and 101st Airborne were dropped; their mission was to take control of the area inland from Utah Beach. A LCA just launched off HMCS Prince Henry carrying troops towards the Normandy beaches. Photo by Dennis Sullivan. Department of National Defence / National Archives of Canada, PA-132790. At dawn, the weather was still bad; a northwesterly wind was blowing at 15 knots. Channel waters were choppy with waves over one metre. And clouds were piling up. At 0530, destroyers started pounding the coastal defence positions. As thousands of engines roared and bombs exploded in the air, the LCAs were launched and the soldiers boarded them. In a few minutes, 130,000 men would be landing on French soil to oust the Nazi invaders. Operation Overlord was only one step of a global strategic plan for the complete defeat of Nazi Germany. 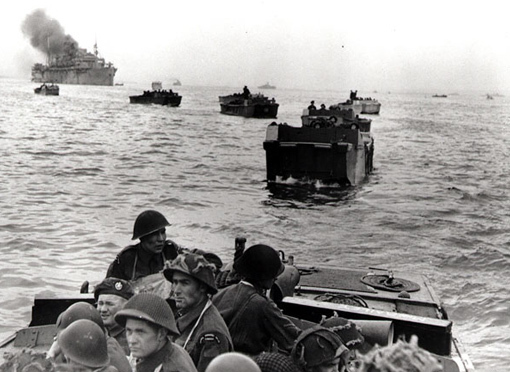 The Normandy landing was designed to establish a bridgehead from which two armies, the First US Army on the west flank and the Second British Army to the east could be supplied by sea. With the bridgehead firmly secured, the armies were to move on to liberate France and the neighbouring countries. Germany, attacked on three separate fronts, in Northwest Europe, in Russia, and in the Mediterranean, would soon be exhausted and defeated. 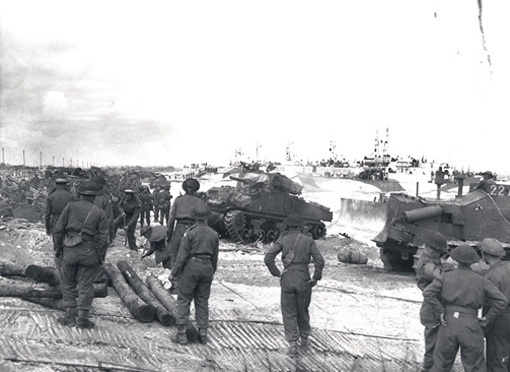 On June 6th, 1944, the 3rd Canadian Infantry Division and the 2nd Armoured Brigade were tasked with establishing a bridgehead on the beach codenamed “Juno”. This was an eight-kilometre long stretch of beach bordering Saint-Aubin, Bernières, Courseulles-sur-Mer and Graye-sur-Mer. Assault troops were then to move towards the Carpiquet airfield, 18 kilometres inland. The 3rd Infantry Division, under Major-General R.F.L. Keller, was under command of the Second British Army. It was flanked on the left by the 3rd British Infantry Division that was to land on Sword beach (Lion-sur-Mer, Langrune-sur-Mer). To the right, the 50th British Division had as its target “Gold Beach” (La Rivière, Le Hamel, and Arromanches). Photo by Dennis Sullivan. Department of National Defence / National Archives of Canada, PA-132651. Before the infantry actually set foot on the beach, all artillery launched a saturation barrage against enemy defences. Destroyers pounded the beaches and the large landing crafts approached with their 4.7-inch guns firing. Landing craft Tanks fired rocket rounds. The four field artillery regiments, in all 96 guns of 105-mm, embarked on 24 LCTs, moved on simultaneously. From its craft the 12th Field Regiment opened fire against a fortified position in Courseulles. At 0655, the 13th Field Regiment attacked another position west of the cliff. At 0744, the 14th Regiment fired on the Bernières fortified position; and at 0739, the 19th Regiment attacked a similar post in Saint-Aubin. For half an hour they fired above the heads of the infantry and above the LCAs that were by the shore. As we moved farther from the mother ship and closer to shore, it came as a shock to realize that the assault fleet just behind us had completely disappeared from view. Suddenly there was just us and an awful lot of ocean) or English Channel if you prefer. All that remained within sight was our own fleet of ten assault craft, moving abreast in the early-morning silence in a gradually extending line facing the shore, the A Company boats on the right and the B Company boats on the left. Daylight. We had never felt so alone in our lives. 1st Hussars tanks and men of the 7th Infantry Brigade landing on a crowded beach at Courseulles-sur-Mer, June 6th,1944. Photo by Ken Bell. Department of National Defence / National Archives of Canada, PA-128791. 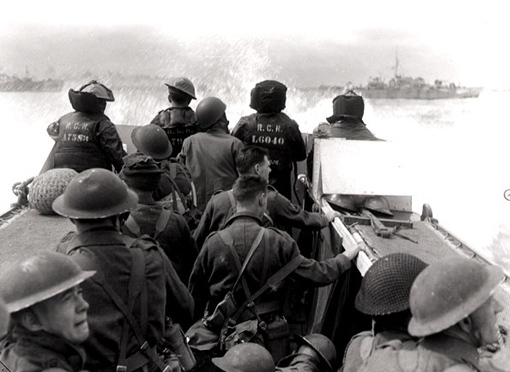 In the west, the first assault troops of the 7th Infantry Brigade landed shortly after 0800 near Courseulles-sur-mer. Somewhat further east, in the sector of the 8th Brigade, the North Shore Regiment set foot on the Saint-Aubin beach at 0810 and the Queen’s Own Rifles started to march on Bernières at 0812. As they ran under heavy enemy machine-gun fire, the men were quick to forget their nausea due to choppy waters and rolling ships. But bad weather still had an impact on the operations: landing the tanks was hindered and the LCTs had to move in closer with the risk of hitting a submerged mine. As they set foot on the beach, men of the “B” Company of the Queen’s Own Rifles had to run 200 metres against a German defensive position spared by the saturation fire earlier on. They suffered most from the delayed arrival of the DD tanks, Sherman tanks equipped with floating devices that the height of the waves had rendered useless. It suffered one shell hole in the steeple. We soon saw the big hotel that is a famous painting now. Then we saw the five pillboxes mounted on top of the sea-wall. These were our first objective. About five hundred yards out, they had us in the sights of their small arms and began shooting. We had never been under real fire and realized it when bullets were hitting our assault craft. I said to Doug, as if we should be surprised, “they’re shooting at us” and we ducked down below the armour. 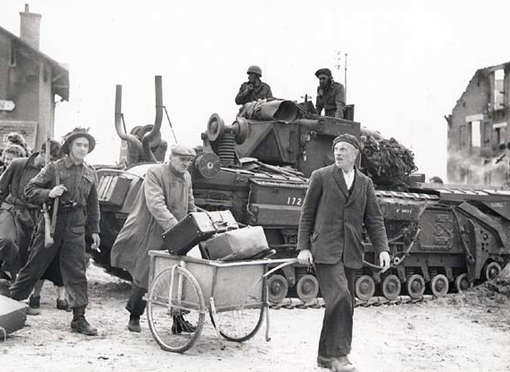 Helped by a sergeant, French civilians walking by a tank in Bernières. Photo by Frank L. Dubervill. Department of National Defence / National Archives of Canada, PA-132725. Taking advantage of the surprise, the first assault troops silenced the 75-mm and 88-mm guns and ensured access to the beaches. Around 0830, they were followed by the reserve battalions. At 0910 and 0925, the 19th and 14th Field Regiments landed and positioned their self-propelled guns for combat. The ever-increasing number of troops and vehicles on the beach made circulation more difficult. To solve the problem, Royal Corps of Engineers personnel opened up breaches in the seawall protecting the beach. Our first attempt to deploy the normal unit of four guns in the field role occurred immediately after debarment; it should be recalled that our SPs were carrying extra and unusual loads which temporarily rendered them clumsy in movement as well as critically vulnerable to enemy fire. While the fighting still raged, some French civilians left their homes. They were astonished to meet soldiers who spoke their language. Replying to an inquiring villager, a soldier from the Régiment de la Chaudière told him “P’tet ben que oui, p’tet ben que non” (“Maybe yes, maybe no”) with an accent so similar to that of French as spoken in Normandy that the civilian could not believe he was dealing with a Canadian. 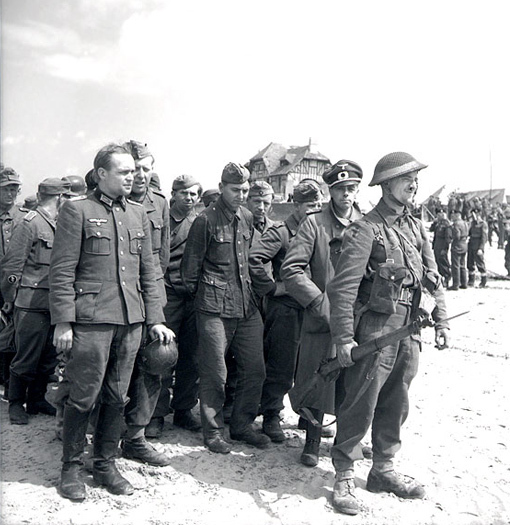 Two German officers in a group of prisoners who surrendered to Canadian troops in Bernières-sur-Mer, June 6th, 1944. Photograph by Ken Bell. Department of National Defence / National Archives of Canada, PA-114493. With the fighting moving inland, the 3rd Division deployed its reserves: the 9th Infantry Brigade, supported by the 27th Armoured Regiment. The first battalions arrived in Bernières at 1140, but the crowding of the beach slowed them down as they moved towards the meeting point near Bény. Fortunately there were no enemy aircraft or ships to attack the massive concentration of men and material that slowly moved inland. As D-Day drew to an end, Canadians had succeed in advancing quite deeply towards Creully, Colomby-sur-Thaon and Anisy, short of their assigned targets but far enough to make the operation a definite success. In a single day, 574 men of the 3rd Canadian Division were wounded and 340 were killed. Such was the price of victory. Some paid more dearly: V US Army Corps at Omaha Beach fought on the beach till the end of day. The Allies had broken through the Atlantic wall and established a bridgehead in France. The Germans were caught unprepared as they thought the operation was merely a diversion, the real landing being planned near Calais. Their disorganized troops were not able to withstand the assault; but they would be quick to redress the situation and the following day, SS Panzer Divisions launched violent counter-attacks to drive back the Canadians. C.P. Stacey, The victory campaign, Volume 3 of the Official History of The Canadian Army in the Second World War, 1960.